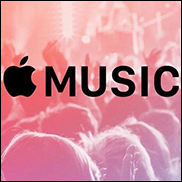 (Hypebot) – 90 day free trials helped Apple Music amass 20% more unique monthly users in the U.S. in February than Spotify or Pandora, says a new just released study by Verto Index. Apple Music had 40.7 million monthly unique users in the U.S. last month, according a new study, That compares to 36.2 million users for Pandora and Spotify with 30.4 million unique users for the same period. iHeartRadio and SoundCloud placed fourth and fifth with 28.5 million and 25.7 million listeners respectively. The study by Verto Index Verto Index tracks 20,000 users in the U.S. and UK via an app, thus missing desktop users. But there is no reason to believe that this omission would not effect all services somewhat equally. Because much of the consumer time spent with streaming music properties occurs while the app or site is running in background mode, the study focuses on the number of sessions per user, per month as the best indicator of user engagement. The stickiest property in the study was YouTube Music, which has a 35% stickiness rating but attracts just 2.5 million monthly users. Spotify had a 25% stickiness rating.